Let us remember Mrs. Ismay A. Hoyte-Isaac, born on January 29, 1926, in Leeds Village - Corentyne, Guyana (South America); daughter of Jessie Kendall and Alfred Joseph. Ismay attended Leeds Anglican School. Later she met, and married Oswald Hoyte (deceased), and celebrated a union of forty-four years; they had seven children. Ismay later emigrated to the United States, where she worked at the Oxford Nursing home for twenty years as a nurses’ aide, until her retirement. Ismay was known as fashion enthusiast during her time. She would take the utmost pride in her appearance when in attendance at functions. Everyone who knew her, would say that she was always well put together. Although she was a loving individual, but in the same manner, she’ll let you know what she was thinking. Among her favorite things she enjoyed were sewing, cooking, spending time with her children and pets (Toby and Shirley), and most of all, she loved her New York Yankees! She was cared for by all who knew her. In 1988, she joined Long Island City Peoples United Methodist Church, where she served as president of United Methodist Woman, and was also involved in an array of activities. While at People’s, she met, and married Rev. Dr. Acelius Isaac on December 28, 1996; he died on January 27, 1999. She loved God, her church, and the people. She especially enjoyed the church’s annual retreat to Worcester, Massachusetts. She always said how she loved being by the lake as it was a pleasurable trip for her. On October 7, 2014, Ismay was called home to glory by our Heavenly Father. Ismay was preceded in death by her seven siblings, and her mother. She is survived by her seven children - Yvonne, Godfrey, Kenrick, Keith, Rawle, Gillian, and Brynmoore; twenty-four grandchildren, twenty-eight great grandchildren, and three great-great grandchildren; sister, Ethel; brothers, Sonny, and Stafford; and a whole host of nieces and nephews, cousins, brother and sister in-law(s), lifelong friends and neighbors. A Service of Death and Resurrection will be held on Friday, October 10, 2014 at the Fenimore Street United Methodist Church, 276 Fenimore Street, Brooklyn, NY 11225. Viewing will be at the church 4-7 pm, followed by the service at 7 o’clock. 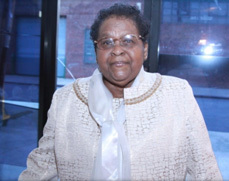 Ms. Hoyte-Isaac’s final resting place will be at St. John’s United Methodist Church of Elmont, 2105 Stuart Avenue, Valley Stream, NY 11580. The family wishes to express its sincere appreciation for the many prayers, acts of kindness and generosity shown to them during their time of bereavement. May God continue to bless each and every one of you.